Tranquil, stylish and luxurious accommodation awaits you in the Sunshine Coast Hinterland. With an intimate cottage for couples and a spacious, elegant house that sleeps eight, The Avenue offers guests two charming accommodation options. 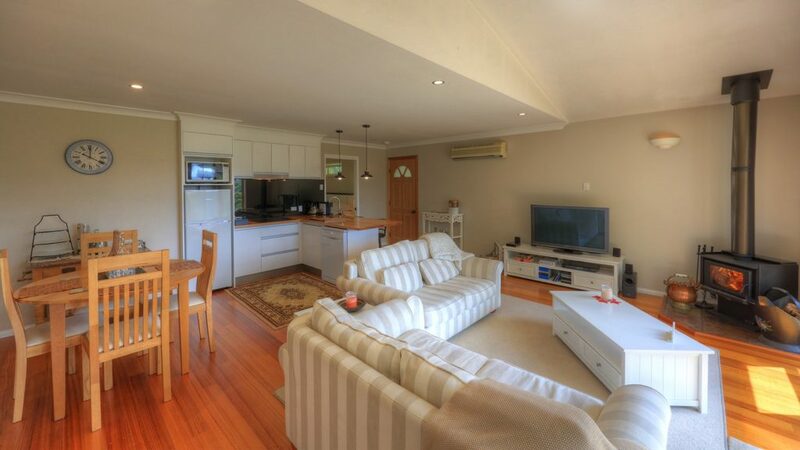 Whether participating in a wedding or just looking for a country escape, you can enjoy a relaxing stay in beautiful accommodation conveniently located just 3kms from the shops and restaurants of the picturesque Montville artisan village. Stunning views across the valley to Kondalilla National Park, abundant birdlife, cosy fires, intimate atmosphere, excellent facilities – the options to relax are endless! The Avenue at Montville luxury house it the perfect destination for small groups wanting to spend quality time together in beautiful surroundings. Whether a family get-together, friends catching up, or a small wedding party, guests will enjoy a spacious, comfortable home in an authentic country setting. Guests can chose from 3 king-size bedrooms on the upper level, or a downstairs bedroom with queen-size bed, all serviced by three well-appointed bathrooms. 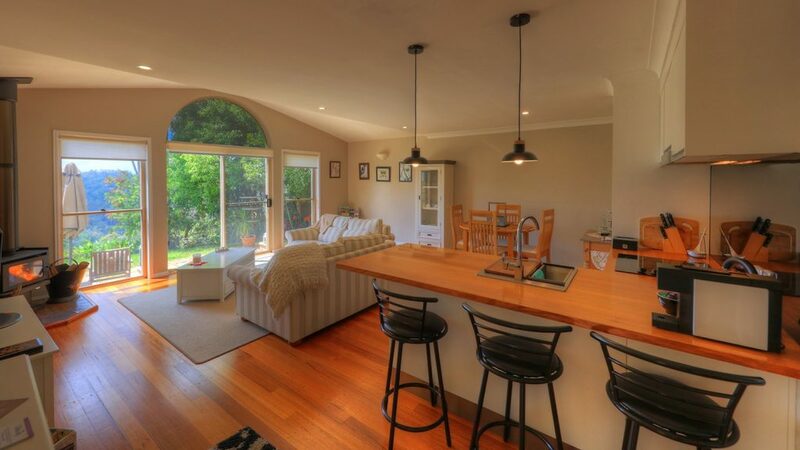 On the lower level you will find a large open-plan dining/lounge area, complete with wood fire, adjacent to the superb, fully-equipped kitchen. 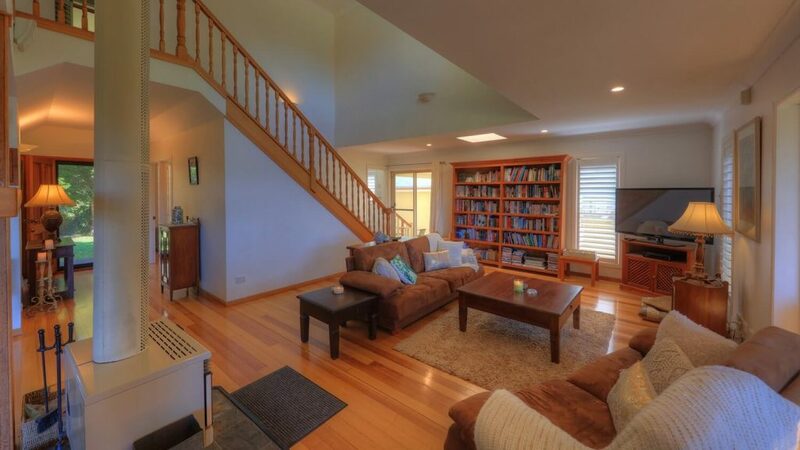 A delightful nook provides the perfect opportunity to escape with a good book from the wide book selection, or even play a board game or two. 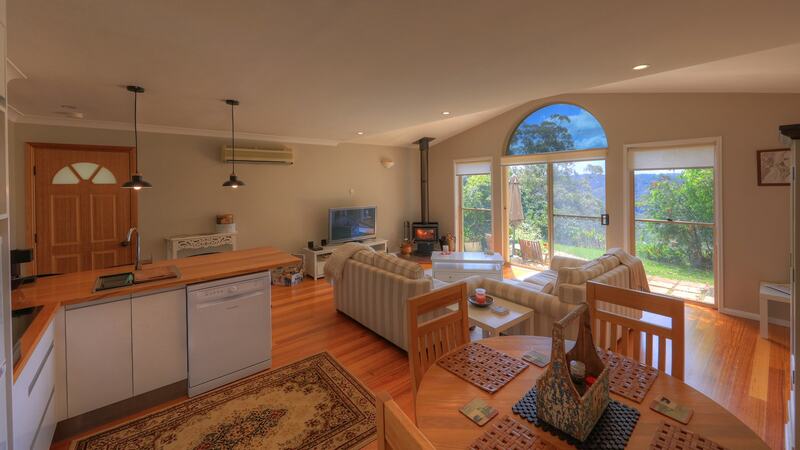 With spacious rooms, super comfy beds, cosy fire, and a well-appointed kitchen, guests can relax indoors with ease, or take pleasure in the stunning valley views from the expansive back deck. All guests receive continental breakfast provisions and visitors who book our house directly also receive 2 complimentary bottles of bubbles and chocolates. 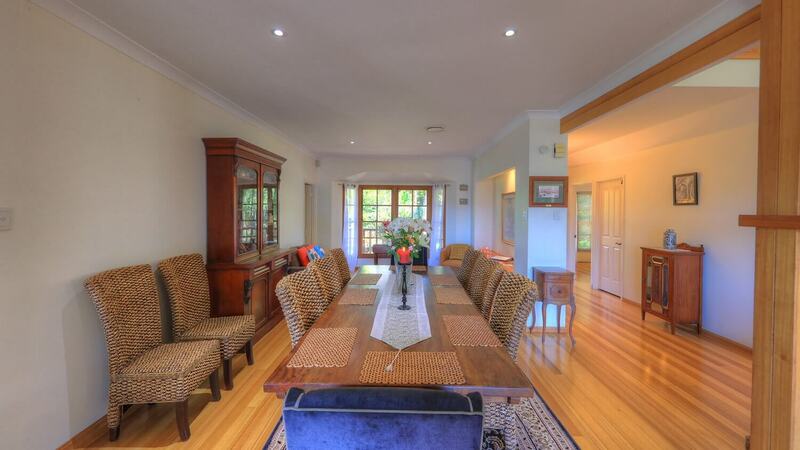 Spacious dining room that comfortably seats eight guests. The ideal room to enjoy a leisurely dinner by candle light. Open a bottle of local wine, immerse yourself in the peaceful surroundings and relax in front of the cosy fire – bliss! 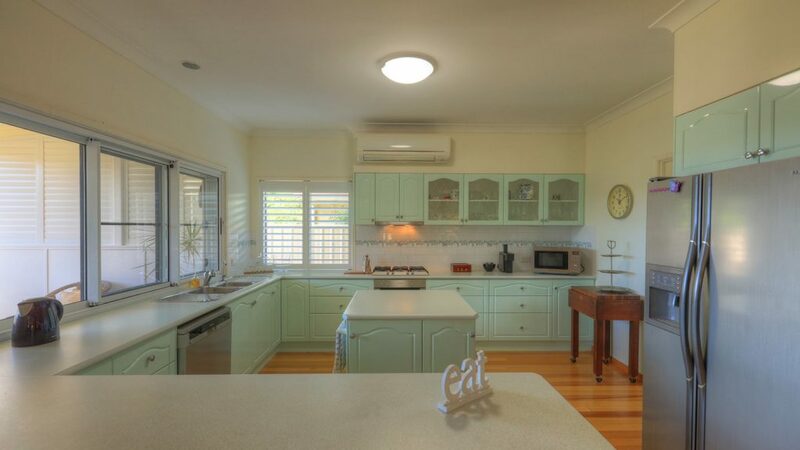 A beautifully appointed kitchen with stainless steel appliances, dishwasher, iced water dispenser, fridge & coffee machine. 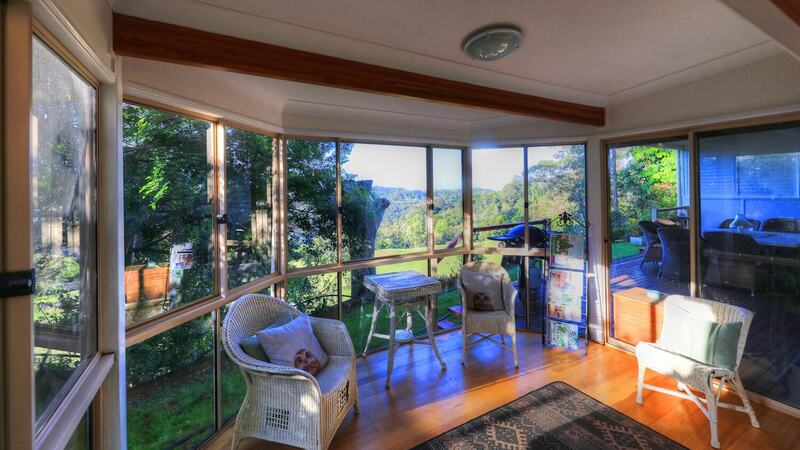 Large windows provide picturesque views across the valley and create the perfect space to relax with a morning coffee. One of the three spacious upstairs bedrooms. 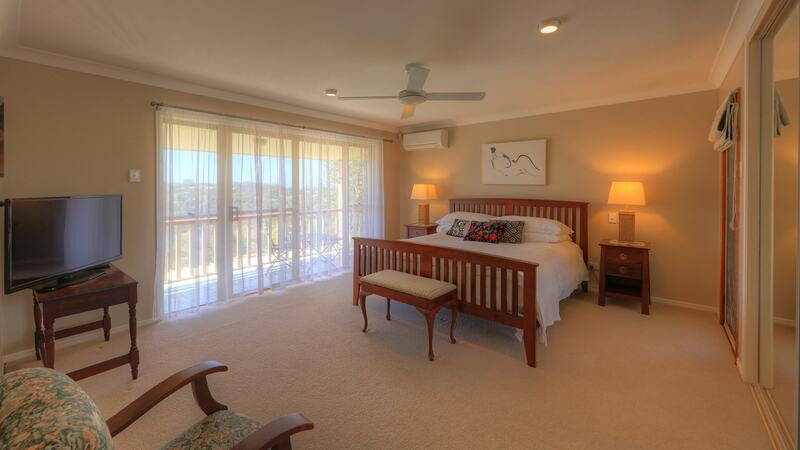 All with King-size beds and ample storage, this bedroom has the added bonus of an en-site and stunning views. 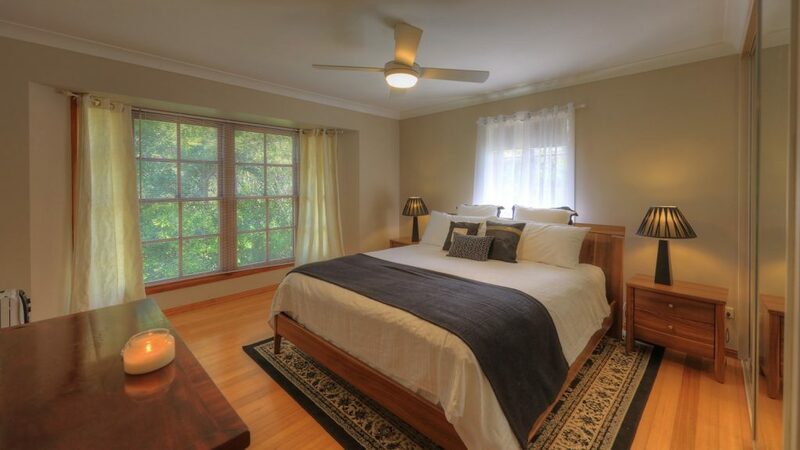 One of the three spacious upstairs bedrooms, all with King-size beds and ample storage. This bedroom features charming garden views. 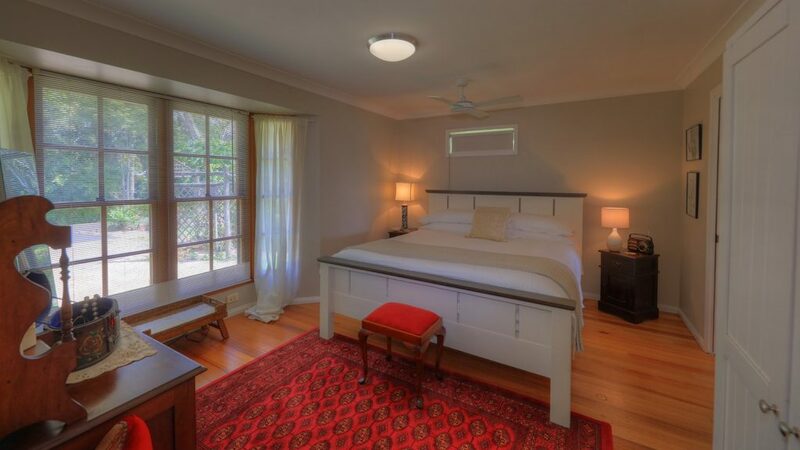 One of the three spacious upstairs bedrooms, all with King-size bed and ample storage. The bedrooms are individually decorated to blend harmoniously with the styling of the home. Luxurious upstairs bathroom that features a double vanity and large walk-in shower for ultimate convenience. 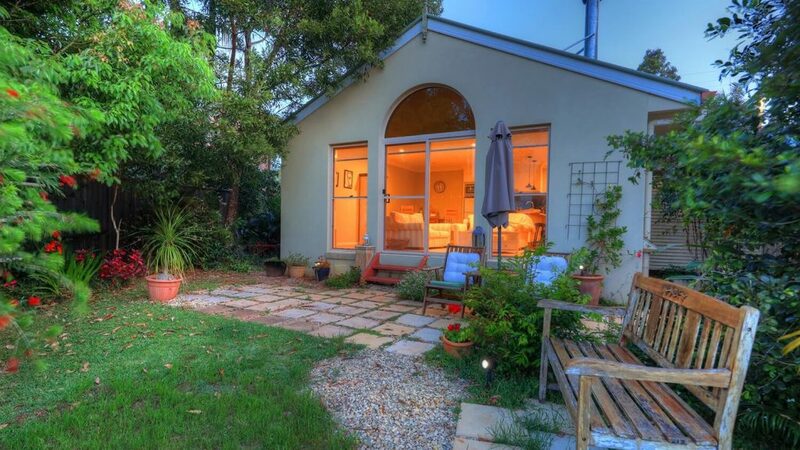 The luxury, self-contained cottage is the perfect getaway destination for couples seeking a dream country escape. 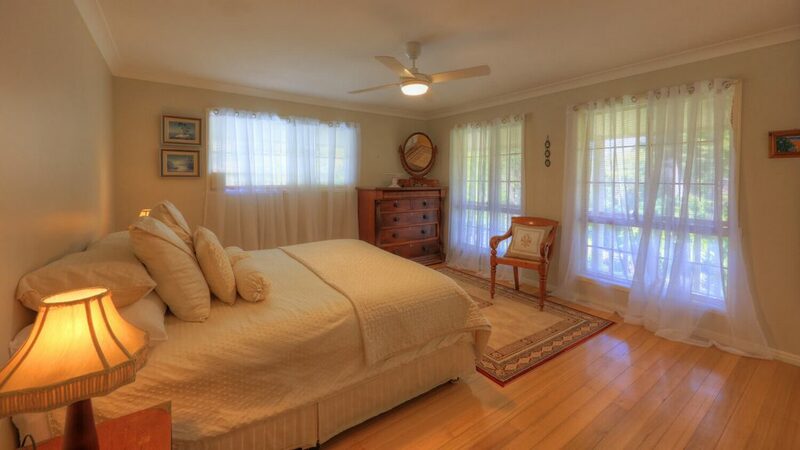 The beautifully presented cottage has a separate bedroom, bathroom and spacious living/kitchen area, all complemented by a charming décor that creates an intimate atmosphere. With warm timber floors, a log fireplace, luxury bathroom and stunning views across the valley, this is a cottage designed with your relaxation in mind!! All guests receive generous breakfast provisions and visitors who book our cottage directly also receive a complimentary bottle of bubbles and chocolates. 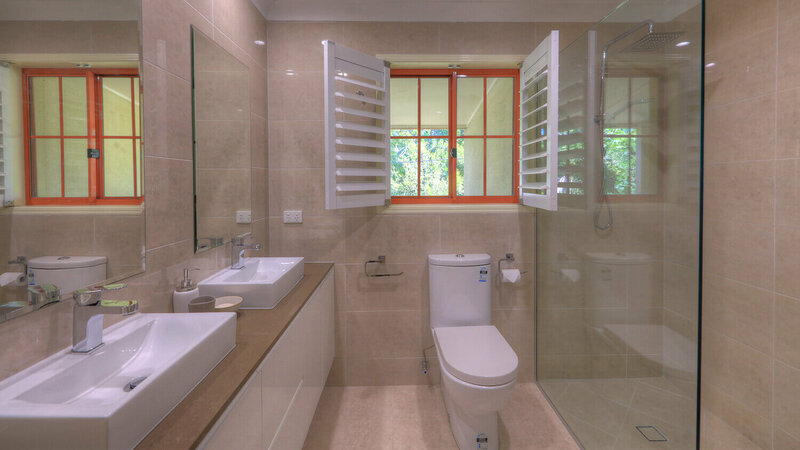 The Avenue of Montville Cottage is a spacious one bedroom, one bathroom luxury cottage designed with your comfort in mind. Large windows provide picturesque views across the valley and flood the open floor plan with natural light. 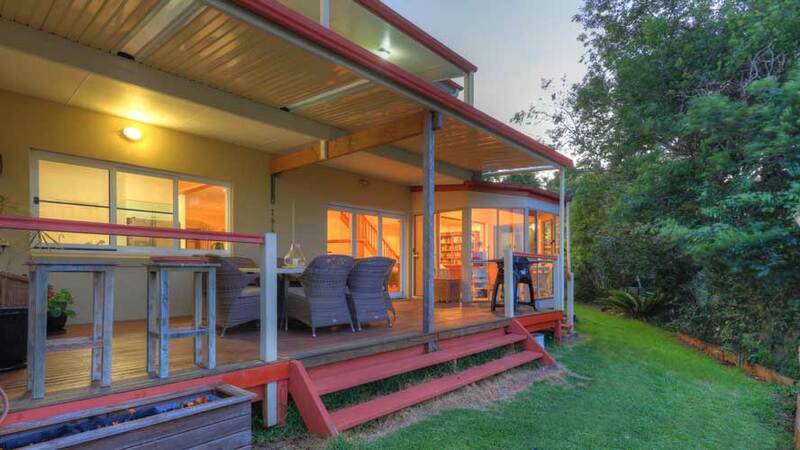 Equipped with a dishwasher, microwave oven and hotplates, AC unit, wood fire and free wifi – your home away from home. The bedroom comes with a super comfy, King size bed and a light filled en suite that features a large walk-in shower and free-standing bath. 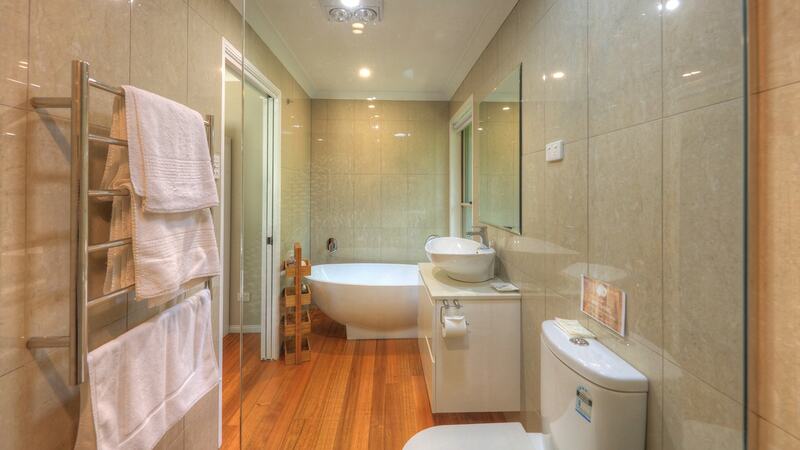 A beautifully styled en suite bathroom compete with a large walk-in shower and tub for ultimate relaxation.